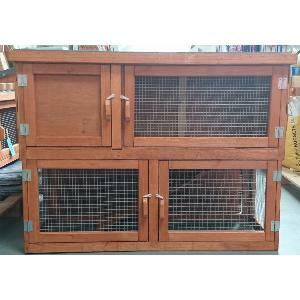 This traditional style 4ft double hutch is made locally from ply wood. It has a felt roof and has also been treated with a wood preservative. Hutch has 4 door openings and a ramp inside for your animal to travel from top to bottom or vice versa. The cage is suitable for the summer months as it has a wire mesh floor, so it can be placed on grass. A winter version is also available too with a woden floor.